. Using graph paper or the graph below, graph the paths. Do they intersect? At what location did the Kennedy rocket meet the ISS? If they did not cross, write no solution.
. Will the supplies reach the space center? If so, at what point will they meet? If not, what adjustments should be made to the supplies path to intersect? Use graph paper or the image below to graph your information. and the ISS is on the path 8x - 8y= 0. Using graph paper or the image below, graph the equations and decide if the astronauts will meet the ISS. If they meet, what location do they meet? If they do not meet, how can you adjust the path for them to meet? Tanegashima Space Station is sending supplies to the ISS. The ISS is currently on the path -3x+6y= -3 and the supplies are being sent on the path -6x+8y=2. 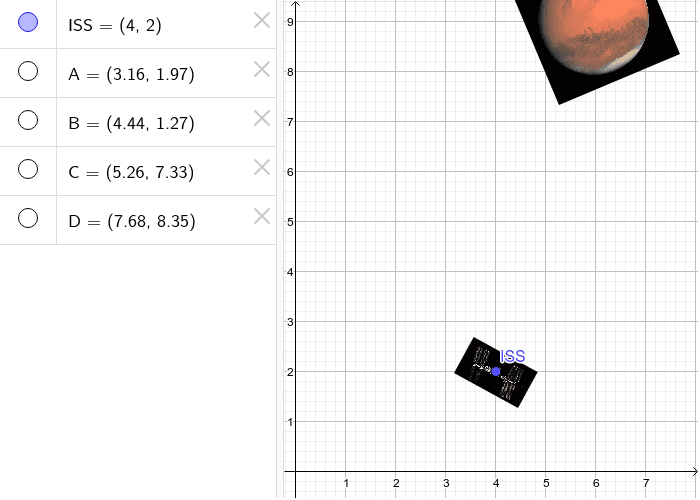 Using graph paper or the image below decide if the supplies will intersect with the ISS. If so, what is the intersection point. If not, what changes need to be made to the supplies path to reach the ISS?
. The ISS is graphed below, will the astronauts reach the space station. Graph the path the astronauts will take. Yes, the astronauts get to the ISS. No, the path should be recalculated.
. Will we intersect with the ISS on our way to Mars? No, we will not intersect.